This is the whole pork liver I cured this past February. It was interesting to cure; curing an organ is very different from curing skeletal meat. The biggest difference is the huge amount of liquid the liver let out when packed in the salt cure. I think I had to drain off the large pools of liquid at least three times during the curing. Reapplying the cure, I worried this would make the liver overly salty, but I erred on the side of caution and went with more salt rather than less. Rubbed in black pepper and wrapped in cheese cloth, the liver cured very easily. I think a big part of that was the wide, flat shape, which allowed for very even curing. Cutting it down, the liver looked much as it did when I first hung it to cure; just harder and drier. Slicing off a small end piece, I was surprised by the mild taste of the liver. 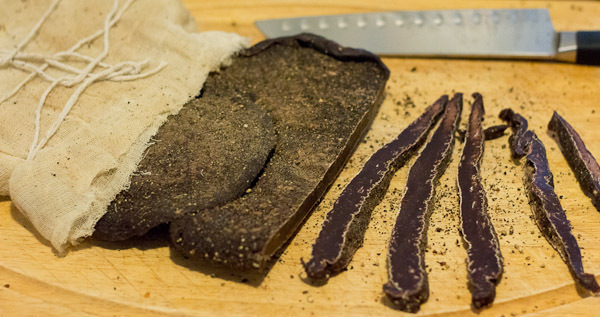 The texture was dry, salty, and somewhat “fibrous,” like chewing a piece of beef jerky and having it break into little strings of meat between your teeth. I followed Fergus Henderson’s recipe for a salad with cured pork liver and balsamic vinegar. 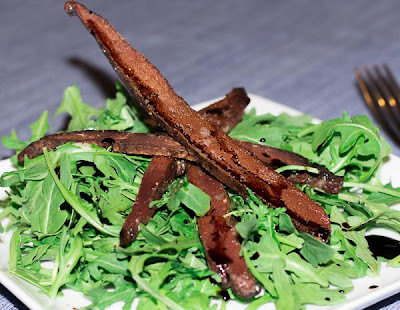 This involved quickly searing strips of the cured liver, then topping the peppery arugula salad with the live and a light drizzle of balsamic vinegar. At first I liked the salad, but searing the liver seemed to bring out the stronger flavors of the organ. On the plus side, the cooking did soften the cured liver…briefly. After eating about half the salad I stepped away to get some water. Coming back the seared liver had cooled and become incredibly hard and tough. Clearly the key phrase is “serve immediately.” With a whole liver I doubt I’ll eat the entire thing as a salad topping. But there’s a lot of potential in this cured liver. The strong, salty nature reminded me of Italian bottarga, which is dried, cured tuna or mullet roe sacs. The bottarga is normally shaved fine over pasta or salads to bring a strong, sea-brine flavor to dishes. I think this pork liver could be used in the same way. Or I could do a twist on Momofuku’s shaved foie gras, where a torchon of frozen foie gras is grated into a fine fluffy cloud with a microplane. It makes for a very intense, but light and powdery hillock liver.